Starhub ONT already split both Internet and TV services by using Port-1 for Internet/router and Port-2 for Fibre TV while ports 3 & 4 are null, not in use. Let Starhub provide this switch since you are taking 2 STB(s) or more, as others did mentioned in other threads/posts. Since you already have 2 separate ethernet cable trunking then 1 for TV from switch while the other for Internet/router. Sharing the same ethernet cable for both Internet & TV signal would require additional managed switches and settings. Hi, anyone with redbean rt-152 here? Able to share with me the power adapter voltage and current? I got 1 without the adapter and need to look for 1.... Thank you very much! Thanks for the tips. I tried to use my hub ID to log in and Starhub Go app worked for both of me two boxes tested, H96 Pro Plus and H96 Max Plus, both running Android OS 7.1. “Go Local - Watch for free” section and two Live TV channels are there, MaxToon HD and Love Nature HD. Then I tried my other two lower end boxes. On the R69 2GB/16GB rooted box with RK3229 CPU Android 7.1, it also worked. On the other hand, Starhub Go app failed to install on my X96 Mini S905W 2GB/16GB rooted box which also runs Android 7.1. So in the end, it may work, it may fail . YMMV, no guarantee. Still StarHub Go app is designed for mobile phone and I am using a USB wireless keyboard/mouse combo for the testing. So it is still better to use mobile phone plus Chromecast. I just tried with my iPhone 6S and my 1st generation Google Chromecast and StarHub Go works fine on my dumb TV with Chromecast. Vin001 and eric3743 like this. Last edited by xiaofan; 25-02-2019 at 10:09 PM..
Just as a test with my 1st gen Chromecast (2.4GHz wifi, 1080p only) and the following apps on my iPhone 6S. It should be similar with Android phone. Viu — working on the phone but can not cast to TV, it says that you need Viu Premium Subscription in order to use Chromecast to Cast to TV. TVB Anywhere SG: free content works on the phone after registration, not supporting Chromecast even if you have the subscription. I also tested X96 Mini Amlogic S905W based 2GB/16GB generic box running Android 7.1. This box is not recommended because of thermal issues, Tanix TX3 Mini is better and at similar price. Tanix TX3 Max is also better and only slightly more expensive. Last edited by xiaofan; 26-02-2019 at 08:30 AM..
Just to complete the test, I also tested R69 RK3229 based 2GB/16GB box running Android 7.1, this box is not recommended. Last edited by xiaofan; 26-02-2019 at 08:28 AM..
Yeah, I meant this, i.e. whichever port that is currently being used for my SH TV signal from my Modem-Router. Ok I will check with them later on who will be supplying the switch. Thanks for the tip. Hopefully Starhub can provide you the switch for free. Even if Starhub does not provide the switch for free, it should be very cheap as well because you only need a dumb 10/100M switch in your case. A dumb 5-port gigabit switch is only at around S$25 now. Take note you do not need to use smart switch like TL-SG105E which is more expensive but still only at S$39. Last edited by xiaofan; 26-02-2019 at 09:08 AM..
since you have catered for lan cables for starhubtv, what you need is a $20 dumb 10/100 ethernet switch. Both you and Xiaofan have advised that the cost of getting such a switch is not too high. Agree. By the way, you mentioned 10/100 as opposed to a 1 Gigabit switch. Are you saying SH TV signal don't require one that supports 1 Gigabit? I am currently using the TP Link SG105E for my other LAN (for PCs and Network Audio player, etc). I need to go read about the difference between Smart switch and dumb switch. Noob here! Last edited by Vin001; 26-02-2019 at 09:12 AM..
100M switch is good enough. On the other no point to get 100M switch now since gigabit switch is very cheap already. TL-SG105E is capable of supporting vlan for Starhub Fibre TV use case with mixed internet and Fibre TV from 2nd ONT port. It is also capable of supporting vlan for SingTel fibre broadband uses case where SingTel use vlan function to deliver Fibre Internet and Fibre TV from the same ONT port. In your current use case, I assume you have your ONT port 1 for internet usage and your TL-SG105E is used together with your wireless router to connect to PCs, network audio player, etc, it may be overkilled since you are not using the smart function. On the other I think it is still a good buy because I feel it is more rugged than the cheaper TL-SG1005D dumb switch. You can buy one more set of SG105E for your second Fibre TV box use case in case Starhub does not offer the switch. You do not need to use the smart function or vlan stuff since you use ONT port 2 for dedicated Fibre TV usage, be it one unit or two units. 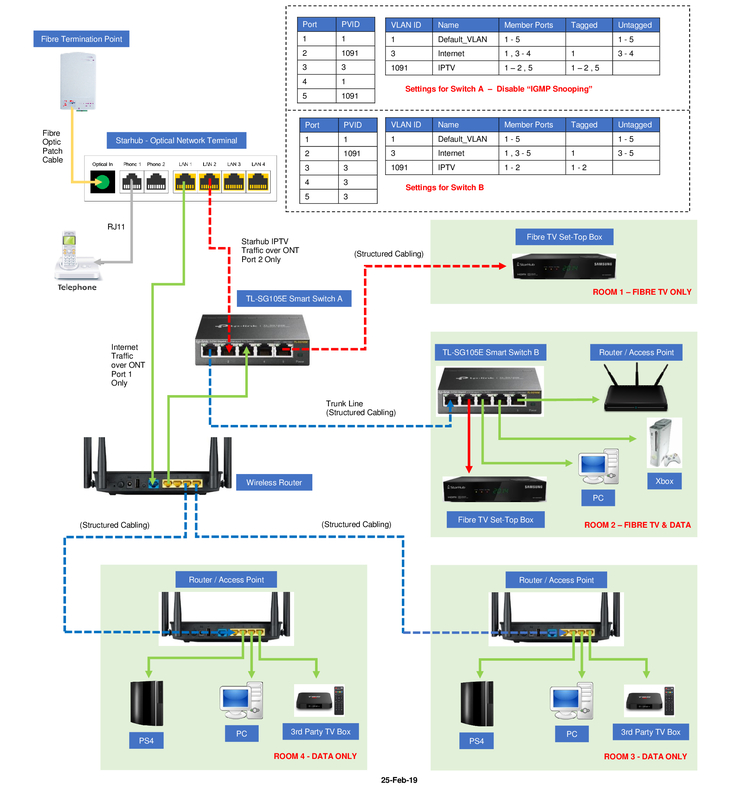 Next time if you need to use the ONT port 2 for internet as well then you can learn to set up vlan for that use case (eg: to connect your Sony TV with Ethernet). Last edited by xiaofan; 26-02-2019 at 11:35 AM..
SH TV uses less than 10Mbps. SG105E is a smart switch, but most likely you are using it as a dumb switch currently. I recently switched from Starhub coaxial to Fibre TV. As I subscribe for two set-top boxes, they provided me with a dumb switch, i think it was the D-Link DGS-1005A 5-Port Gigabit Switch. However, as I had previously only laid one LAN cable to each room, I had to purchase two smart switches (SG105E) separately to use VLAN to push both internet/IPTV traffic across the sole LAN cable. For taking Fibre TV there is one free trunking/conversion provided. And since you don't need trunking/conversion then get the dummy switch &or something else. This D-Link DGS-1005A 5-Port Gigabit Switch is a dummy gigabit desktop switch which i have one with 8-ports DGS-1008A model. 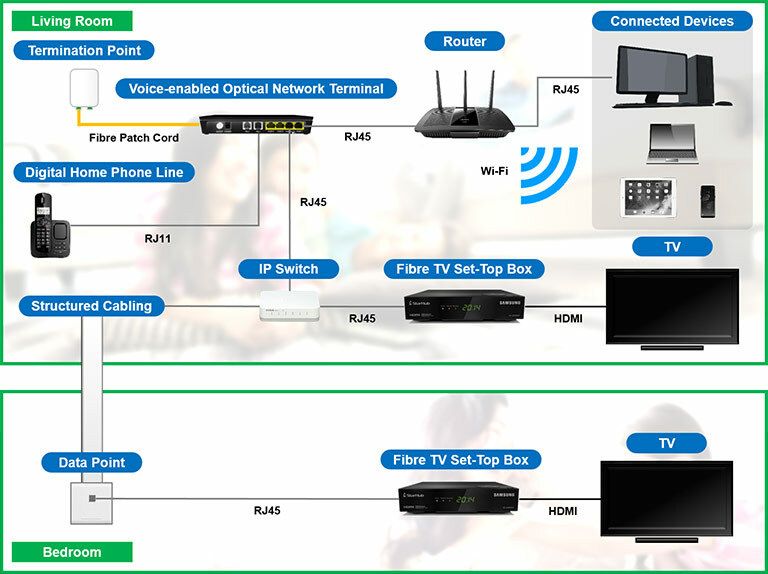 The purpose of 5 ports is that Starhub ONT Port-2 can have up to maximum 4 STB (Set top box).